Ever wonder how to wire a switched outlet? Sometimes it may be handy to have an outlet that is controlled by a switch. What does this mean? Well, simply put, instead of your light switch controlling a light, it will control 1/2 of a receptacle. You can use it to switch lamps on and off, workstations, tv's... just about anything. Or it may be that your ceiling will not support a light fixture or it could be that you would rather have a "lamp-lit" room than a large over head light. Whatever the reason, I can help! 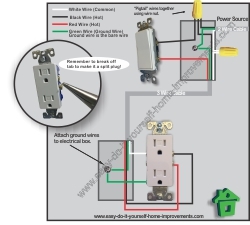 There are many different ways to wire the outlet. 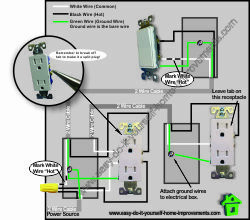 I have four of the most common switched outlet wiring diagrams listed below. Choose the one that best suits your needs and follow the diagram. 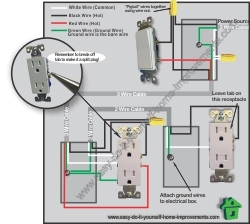 These wiring diagrams will be using split plugs. What are split plugs? 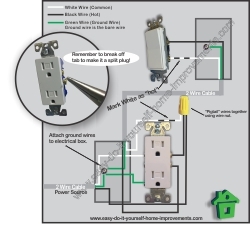 Check out my How to Wire A Split Receptacle page and get the basics before attempting to wire a switched outlet. OK, before we look over each option... Make sure that you have turned off the power to the area you are working in. No sense injuring yourself just because you want to be a DIY Master! Ensure the breaker is off at the panel. In this basic scenario we have the power source coming into a receptacle and ending at a switch. This utilizes a split receptacle so that one side of the receptacle stays hot (always on) and the other is controlled by the switch. This option is very similar to option 1 but reversed... Power is coming into the switch and then ends at the receptacle. This also utilizes a split receptacle so that one side of the receptacle stays hot (always on) and the other is controlled by the switch. Cannot find the option you are dealing with? Contact me and I will help you out. Do you want more receptacles in you room but only one that is controlled by a switch? This option has power coming into the switch, then ending at multiple receptacles with only one being controlled by the switch. This has split receptacles as well as non-split receptacles. This scenario is similar to Option 3 but in reverse. This is especially useful if you are wanting to add a switch to a receptacle in a renovation setting or "after the fact". Power to the switched receptacle then splits to a regular receptacle and switch. 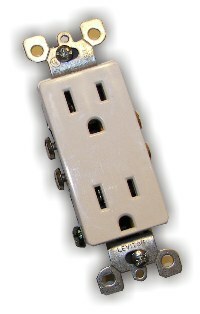 This option also has split receptacles as well as non-split receptacles. As you can see there are so many different options when it comes to learning how to wire a switched outlet. Take your time, follow the diagrams and soon you will be a DIY family handyman too.